Try variant spellings and abbreviations. Enter fewer words to expand results. Search for synonyms. For example: "horse-drawn vehicle" could also be a "carriage" or "buggy." Try exact phrase searching. Add quotation marks around the keywords that you want returned as an exact phrase. For example: "Peshtigo fire." An asterisk (*) can be used in a search term to represent one or more characters within the term. For example: h*s - will return items that have a word that starts with the letter "h" and ends with the letter "s." Examples: "his," "homes" and "houses." How do I search the new Wisconsin Historical Society website? Search more than 3 million records all at once (from a wide variety of the Society’s databases)with our streamlined search box, available at the top of every page on the new site. A site-wide search is likely to return results that include many types of resources related to your keyword, including: photos, maps, essays, books, newspaper clippings, historical essays, lesson plans and/or biographies. 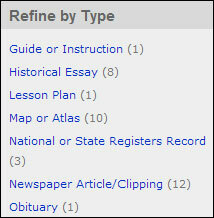 To search by keyword within a section such as "Teach and Learn Wisconsin History" or a topic such as "Maps and Atlases," enter your term(s) into the search box located within the page and click the blue GO button. The search engine will narrow the scope of its scan and your results list will include matches only related to items included in that section or topic. Many of our materials are still available only in physical form and can be searched by using our Library and Archives Catalogs. You can also Explore Our Collections to sample an ever-growing selection of online materials. See our Collections Overview page to learn about the scope and strengths of our collections. How can I sort, refine and/or expand my search results? Search results are returned in a list sorted by relevance. Results can be resorted by clicking on the SORT BY pull-down menu at the top of the results list and selecting an option. Your results page is a list of records. On the left side of the results page are options to refine your search. These options are links. The types and number of links available are based on the content of the records that have been retrieved. From your results page, select one of the links on the left side of the screen to refine your search results. Your results will be filtered further to show only those items associated with the link you selected. As you refine your results list, the link list on the left will automatically refine itself. The remaining links will be the ones associated with your new refined results. It is possible to refine your search to the point where no more links display. As you enter keywords and use filter options, they will appear on the breadcrumb list (a navigation aid), at the top of the Search Results page. Clicking the "X" in any Breadcrumb will remove it and expand your search results list. Spot a problem with the website? Love a new feature? We'd like to know.